The Ranchero wasn’t that great for ranching cattle, but it was amazingly good at getting ranchers from farm to town in the shortest possible time - when required. In the early 1990s, Ford decided to do something rather unusual and build a bakkie which could lap racing circuits at a pace not much slower than its Mustang muscle car. Didn’t handle too tragically around corners either and with special rubber inserts added to the rear-axle’s leaf springs, wheel-hop during full-throttle acceleration was marginally contained. It featured a great many more trick aero and styling bits than the 1993 Lightning's and although the V8 engine was slightly smaller, at 5.4-litres, it now benefitted from a crank-driven boost in the form of an Eaton supercharger. Generally misunderstood due to its amazing off-road racer styling, the secret to Raptor was all the custom engineering beneath its menacing appearance. Raptor was a road-legal version of Ford’s Baja 1000 off-road racing bakkies and featured similar long-travel Fox suspension, the kind of stuff you ordinarily can’t buy – even if you have a lot of bitcoin and ask nicely. 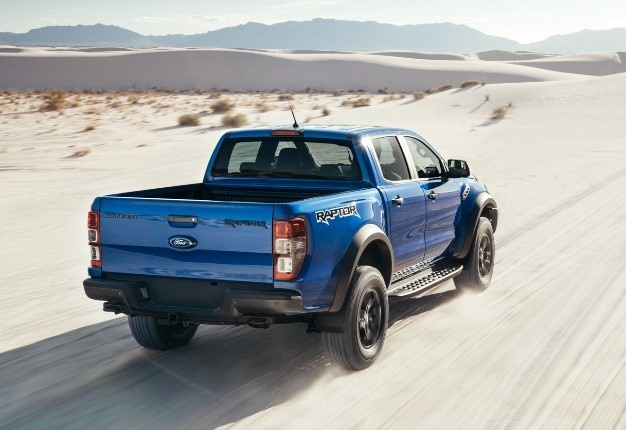 Beyond the amazing suspension technology, which enabled it to clear rough terrain at speeds which would break any other bakkie, it was Raptor F-150’s 6.2-litre engine which won over most pundits.